Because of its deep v-neck, the summerly color and the fresh design with its playful pompoms this super modern jumpsuit is perfect for either the beach or the pool - get ready for a hot summer. This cropped top is young and stylish and fits perfectly to everything. It emphasizes the sensual femininity subtly and the airy cotton underlines the modern ease of the design. This modern high waist boxer got a playful drawstring and casual pompoms. With those pants style is your permanent companion. Furthermore the casual cut and the super soft fabric invites you to a relaxing time in the sun. This charming hoodie with its playful cording, stylish pompoms and casual cut makes the summer even more beautiful. A true must-have for hot days and breezy nights. Super soft shirt in flowing modal with a scooped neckline, batwing sleeves and hemming tape in a contrast color. The color blocking adds a very modern and stylish vibe to it. The floral printed shorts made of super soft knitwear are a modern eye-catcher. 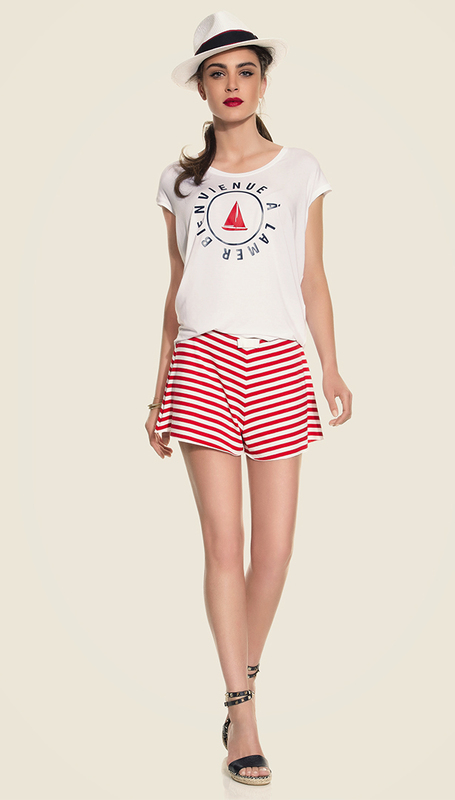 The stylish summer shorts come with handy side pockets and an adjustable drawstring. This tunic makes you crave for summer! It is feminine, playful and laissez-faire at the same time. The low v-neck, the bold color blocking and the wide kimono sleeves emphasize the casual and modern look. This stylish tunic made in Italy is breezy, light and multifunctional. Because of the airy a-line and the fresh design this style is perfect for hot summer days and cozy summer nights. Pure cotton, fine hole embroidery and a summerly ease are the perfect ingredients for a stylish day on the beach. That's how beautiful „made in Italy“ can be! This striped tunic is perfect for warm summer days. It is made of 100% pure cotton and features an airy-light cut. Furthermore the mediterranean design with ist stripe elements emphasizes the laid-back esthetics. This summer dress made of soft modal has a modern v-neck, a straight, casual cut and a slit on the hem. The light dress lets you enjoy the summer ease with style. This tunic plays with its feminine touch. The modern print and the sophisticated details are real eye-catchers. The light viscose and the casual look promise a cool appearance on every summer party. These short pants are made of fine viscose and they have a very modern cut. The softband is soft and elastic with a pretty bow in the middle to add a feminine touch. This casual shirt made of fine modal sets a modern fashion statement. It has a relaxed fell-good-cut, a super soft touch and the print guarantees a stylish esthetics. This timeless shirt in a classic stripe design never goes out of style. It is made of viscose and therefore has a super soft touch. Modern and classic at the same time - a high waist boxer shorts made of fine woven fabrics with couture-details made in Italy. These boxers are a true must-have this season. The playful sleeves emphasize the feminine design of this super soft shirt and the modal underlines the high quality. We praise the femininity! That's how „made in Italy“ looks like. Combine high-quality workmanship with 100% pure cotton and add handy side pockets and a relaxed drawstring and you get these stylish high waist pants. A piece of art! The timeless design and the super soft touch of this shirt bring classy comfort in your everyday life. It has a casual, laid-back cut that´s been supported by the fine and cottony modal. Style meets cosyness - these 7/8 pants with their loose fit and super soft touch take comfort to a whole new level. Those casual feel-good pants provide ease wherever you are and catch the eye whenever you want. The close-fitting tank top impresses with its super soft touch and its modern design. The premium modal emphasizes the high-quality workmanship and the stylish color-element underlines the urban style. The soft and elastic fabric ensures a high level of comfort and a perfect fit - a tender essential for every day. The timeless design and the high waist add modern elegance to it. Modern jumpsuit with handy side pockets, stylish flounce, super soft touch and playful details. A true fashion statement on hot summer days.